Google Data Studio has introduced third-party data connectors via super Supermetrics and a few others to allow you to easily display more data sources in your reports. The new Community Connectors make it possible to easily bring social, display and other platform data into Data Studio. 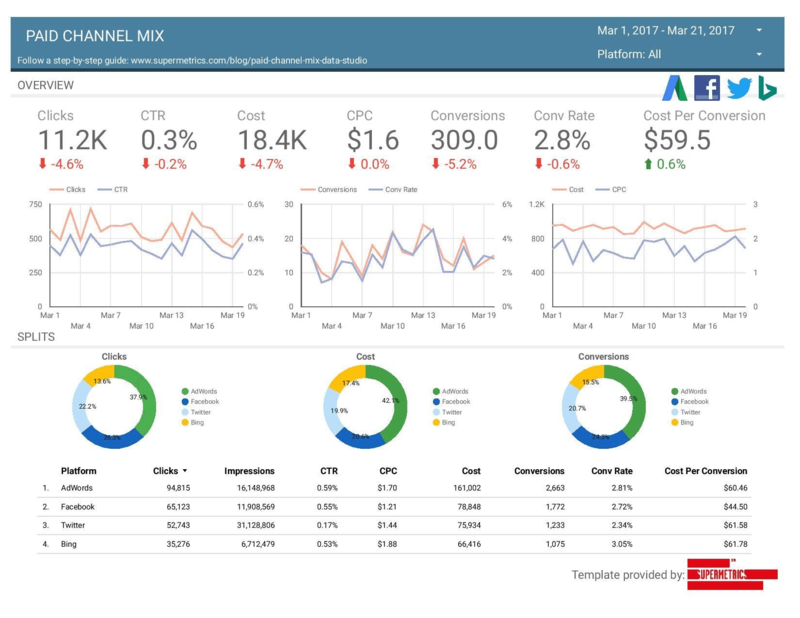 Google Data Studio, Google’s free tool for creating visual reporting dashboards, now allows you to natively connect to other Google products such as AdWords, Analytics and Google Sheets which was great for reporting but many marketers wanted to consolidate reporting from other channels which were a pain using data dumps into google sheets or setting up an API via google sheets, a taxing and technical process. It is also worth mentioning that importing data from other sources using Google Sheets is not always an elegant or comprehensive solution. Google introduced a beta for third-party connectors with Supermetrics is among the launch partners. Users of data studio will find the new options in the Data Studio Community Connectors Gallery. 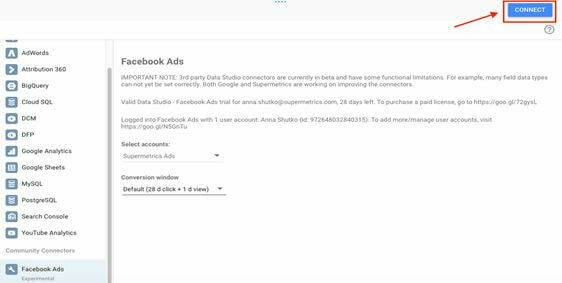 The native connection enables data from the 20-plus marketing platforms Supermetrics connects with, such as Bing Ads, DoubleClick, Facebook Ads, LinkedIn Ads, Twitter Ads and Yahoo Gemini, to be brought into Data Studio seamlessly. With this new connection, reports can blend paid and organic reporting from social channels, for example, with data from Google Analytics to get a fuller picture of campaign performance. Or make it easy to show paid search performance from AdWords and Bing Ads side-by-side. Supermetrics’ own Google Analytics connector also has an option to avoid sampling. Here’s an example of one of the Supermetrics templates for Google Data Studio that shows campaign data from AdWords, Facebook, Twitter and Bing Ads. Once the third-party connection is established, the process for creating reports is the same as when using Google data sources. Along with this new beta, Google has added the ability for users to embed interactive Data Studio reports on their websites. Select Report > File > Embed report, then put the HTML code snippet into an iframe. While still far off being a complete reporting solution, it is definitely a step in the right direction for Data Studios, but there will still be some teething problems, questionable reliability of the connectors and finally a learning curve and tagging issue when creating your reports from various data sources. If you're serious about reporting and not keen on waiting for better upgrades and not into dealing with 3rd party issues I would recommend Microsoft's Power BI as a better alternative.